While we frequently update lists of the best guitar pedals (fuzz pedals, delay pedals, reverb pedals, etc.) and even keep an updated list of the best guitar pedals currently available, we haven’t previously done a “Pedal of the Year” award or anything like that. Gonna do something like that, only better…. We’re rounding up the Top 15 Best Guitar Effects Pedals of the Year 2016. What prompted this article was a bit surprising. It reminds me of when we first launched the “Top Fuzz Pedals” roundup. A rad pedal caught my attention: the Black Arts Toneworks Pharaoh. Discovering that pedal made me want to round up the best fuzz pedals on market and create a definitive “best of” list. These lists are always a work in progress as new pedals are always being released; there’s a lot to keep up with. 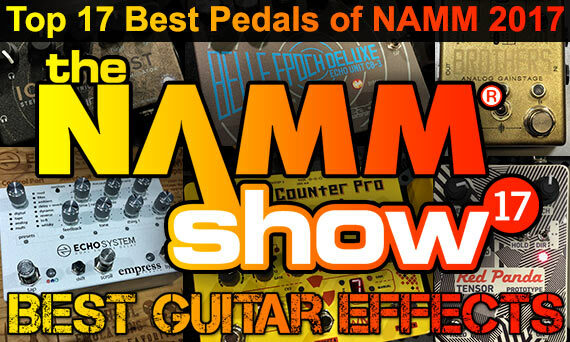 But similar to our static Best Pedals of NAMM articles, we’re going to look back at the year 2016 and showcase the best pedals released during the year. Of all the great pedals that arrived in 2016 (and there were plenty! ), it was the Hologram Electronics Dream Sequence that surprised me the most. I got word of this pedal in January before The NAMM Show 2016. I was intrigued but skeptical of this debut offering from an unknown pedal builder, but the Dream Sequence certainly seemed like a promising pedal concept. When I finally got to spend of time with it near the end of 2016, it exceeded my expectations in a big way for being one of the few new guitar pedals to come out this year that points in exciting new musical directions. The Dream Sequence solidified Hologram Electronics as a builder to keep an eye on in 2017 and beyond. This list is going to focus on pedals that are exceptional in many different ways, and each of these commendable pedals are a “Pedal of the Year” for making it into this list. But instead of trying to compare all the different factors possible for ranking them (tones, versatility, etc. ), the ordering listed below focuses on pedals that inspire new approaches to making music with guitar. As the pedal market and media outlets become cluttered with “me too” releases and pedals that retread the same ground to death, Best Guitar Effects will make further efforts in this list and in our coverage in 2017 to focus on innovation as the most important criteria for judging the merits of new guitar pedals. If you’re looking for new effects to take your guitar playing into new realms of creativity, surely some of these pedals will be worth further consideration. 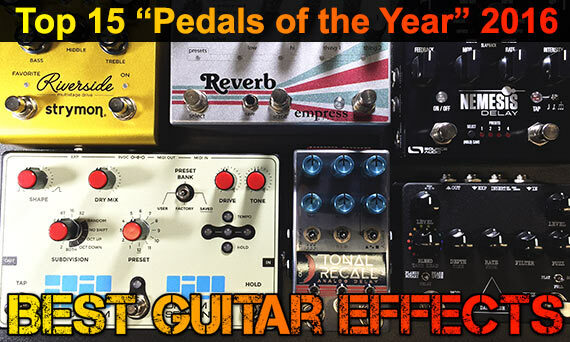 Here are the Top 15 Pedals of the Year 2016! 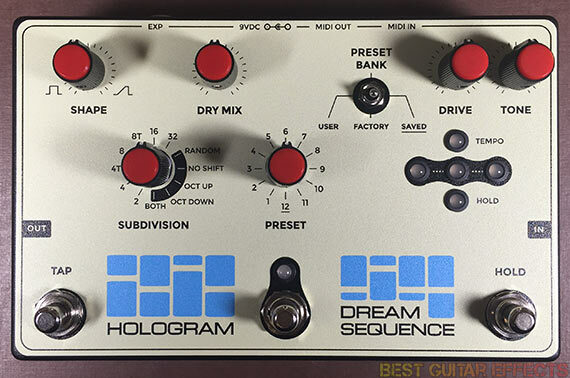 The Hologram Electronics Dream Sequence is one of the more exciting guitar pedals to be released in the past several years and probably the most exciting debut pedal since the Chase Bliss Audio Warped Vinyl. While the Dream Sequence is a bit hard to categorize, it’s essentially a digital octave pedal that lets you sequence the octaves heard. It lets you blend your dry signal with 3 digital voices: octave down, middle octave (same as dry tone), & octave up. Now there are plenty of octave pedals out there, but what makes the Dream Sequence so unique is that you can create and store presets that contain dynamic volume automation patterns for each digital octave voice. Imagine having a tremolo on each octave, but the movement can be any kind of rhythmic or polyrhythmic sequence you can come up with over 4 bars. You can even automate the various knob parameters to be saved with your presets. 12 onboard Factory presets give you a taste of the kinds of extreme pitch-shifting automation the Dream Sequence has in store for the lucid guitarists who awaken to its surrealism. Now before you’re led on too much, it’s important to understand how you create the octave automation patterns. You create sequences of MIDI information using an external MIDI sequencer or DAW (digital audio workstation). Ableton Live works great, but Logic or any other DAW with MIDI works, too. If you’re going the DAW route, you’ll also need either a MIDI interface (you can find a cheap one for about $35) or dedicated audio interface with MIDI output. I’ve written extensively about using Ableton Live with Guitar, and the Dream Sequence seems like it was made for this. While I prefer to run an automated effects rig and have used the Electro Harmonix HOG2 for similar functionality, only the Dream Sequence allows you to save patterns to the pedal for standalone use. You can create patterns in an Ableton Live set file, save them to the pedal, and still have a backup file of your favorite sounds for editing later. If you’re automating your rig like I do, you can just send the MIDI sequencing to the pedal in real-time and create extended automation for your music. For very complex automation patterns (or if you’re sending MIDI to other pedals, also, saving and recalling your sequenced patterns from the pedal may be ideal. This pedal is a dream come true, and if it’s any sign of what’s to come, you’ll definitely want to keep an eye on Hologram Electronics. 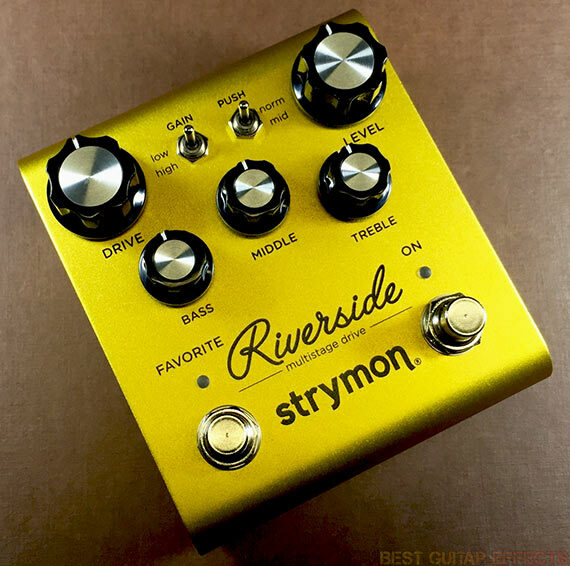 The Strymon Riverside is a late pedal release for 2016, but there’s no doubt it’s one of the year’s very best. As an all-in-one overdrive & distortion pedal that combines analog and digital wizardry into an all-new beast, this pedal is far too versatile to pigeon-hole as a simple dirt pedal as it covers an incredibly wide range of tones from mild, responsive overdrives to heavily saturated, amp-like distortion. While these sound like “buzz” words we’ve all heard again and again, it’s when you put the Riverside next to your preferred dirt of choice that you realize just how supremely versatile it is. It wasn’t meant to emulate a particular amp, overdrive, or distortion sound; it was engineered to surpass the range of usable tones found in any single drive pedal that came before it. The Riverside is a simple enough pedal to use; anyone familiar with their amp’s control panel will know what to do here. In addition to the 5 amp-style parameter controls you’ll notice a couple switches. The Gain switch’s 2 settings – High & Low – completely transform the pedal into 2 different styles of dirt. The Gain switch along with the Drive knob are used to access a wide range of drive tones; the character and response varies depending on where the knob is set. While Strymon hasn’t gone into great detail about the magic taking place to achieve these varying tones, it’s at least obvious that the magic happening in the digital realm allows greater flexibility in articulating how the pedal responds at different knob settings. There’s an incredibly smooth range of sweet-spot tonality throughout the Drive knob’s range. It also cleans up remarkably well with your guitar’s volume knob; the pedal varies its response to your audio input level to retain musical dynamics. The Push switch gives you an aggressive kick in the mid-range and further adds to the great sounds available. The Favorite switch gives you quick access to a preset sound. Use it for a boost setting or have a whole different sound available for quick recall. I’m a fan of the built in gate, a sub parameter that’s great for neutralizing noise with higher gain settings. On a side note, big kudos to Strymon for implementing a smart relay bypass so that the pedal remembers its last bypass state when powering up. This is super handy when using an effects switcher as the Riverside will always remember to power on (like 3PDT pedals) when powering up your pedalboard at a gig. If there was just some kind of MIDI implementation for accessing more of the great sounds or at least the possibility of using a TRS dual foot-switch controller for remotely accessing both of the onboard foot-switch functions. Aside from all that, the tones are flawless and far ahead of the curve compared to digital drive pedals of the past. Here’s a long anticipated pedal that finally dropped in 2016. 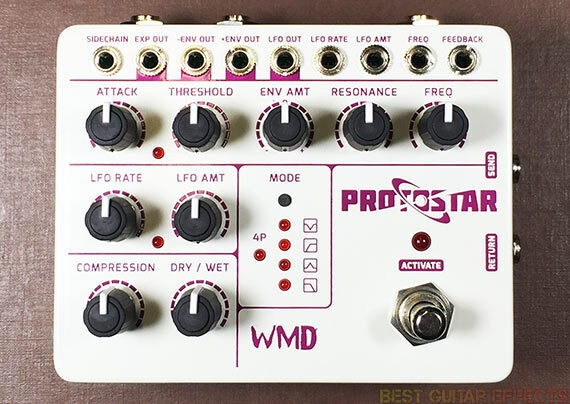 When the WMD Protostar was first unveiled back at Winter NAMM 2015, it was shown under the moniker Super Fatman, the latest successor to WMD’s earlier Fatman and Super Fatman analog filter pedals. The new (and way cooler) name arrived when the Protostar was shown at Winter NAMM 2016 before its release a few months after. The Protostar is a big deal for a several reasons. First off, it’s an incredibly deep analog filter pedal that would be at home in a Eurorack modular synthesizer rig. And in keeping with its modular roots (while taking the modular aspect of guitar pedals to the next level), the Protostar has a 9 jack CV patch-bay for connecting to other CV pedals or integrating into a hybrid pedal/eurorack setup. The Protostar offers a potentially overwhelming amount of possibilities at first glance. At the very least you can use it as an envelope filter to get those funky, quacky auto-wah effects. Or maybe try using the envelope to control other pedals via their CV or expression pedal inputs? What about adding another pedal into the Protostar’s effects loop? How about sending that LFO to control another pedal? Maybe control the Protostar’s LFO from a different pedal? This pedal does things you’ve never fathomed until you start plugging things in and experimenting with it. Now, if the inevitable WMD Geiger Counter Pro will finally come out already. Maybe after Winter NAMM 2017. I’ve sung the praises of the Electro Harmonix HOG2 & EHX POG2 countless times. 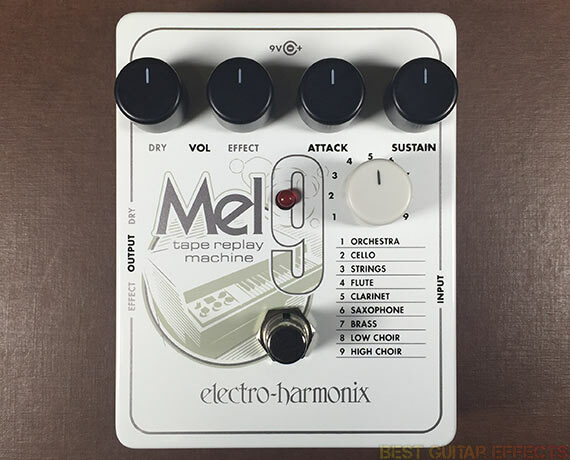 Now EHX’s innovative polyphonic guitar synthesizer technology is on prime display in the Mel9, a guitar synth pedal that mimics some of the most popular sounds of the iconic Mellotron keyboard instrument. Sporting a similar footprint and layout as Electro Harmonix’s other “9 series” pedals (B9, C9, Key9), the Mel9 gives you 9 presets that create sounds far removed from your typical electric guitar tones. It’ll take you from The Court of the Crimson King to Strawberry Fields Forever and even sing you the Moody Blues. Some standout modes include the first several presets: Orchestra, Cello, Strings, & Flute. But all of the presets offer an interesting range of unique textures to add to your music that you’ll only find in this pedal. Attack & Sustain knobs set the response of the wet voicing, letting you adjust how quickly the synth textures ascend to maximum amplitude and decay after a note or chord is silenced. Dry & Effect levels let you set a perfect balance between your guitar sound and the effected signal, respectively. The Effect & Dry outputs let you sum the wet & dry signals to one output (used in a standard mono effects chain) or send the two signals to separate destinations for individual processing. I highly recommend getting creative with signal processing on your wet & dry voices. The most adventurous guitarists use guitar effects pedals to transcend the range of sounds that can be produced by a guitar and amp alone, and the Mel9 offers a palette that will surely inspire. I’ve got nothing but love for guitarists who just stick with just a guitar and amp (although they’re probably not reading this anyway), but those of you who love effects are either imagining the soundscapes you’ll create with this pedal or have already added the Mel9 on your pedalboard. I had my eyes on the Source Audio Nemesis for the longest time. The company had shown this pedal at Winter NAMM 2015, Summer NAMM 2015, & Winter NAMM 2016 before it finally hit store shelves this past Spring. 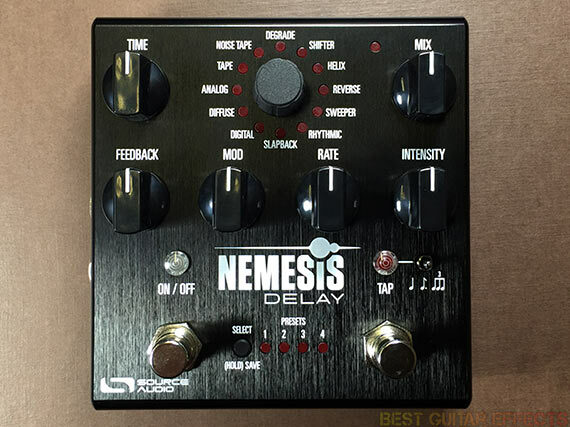 The Nemesis was well worth the wait, and it quickly became regarded as one of the best delay pedals among the many guitarists who’ve added it to their pedalboards. It’s not even fair to make the Strymon, Eventide, & Boss references anymore as the Nemesis has shown that Source Audio stands on their own in terms of achieving an exceptional and diverse set of delay algorithms that are among the best you’ll find in any pedal. Still, the most noteworthy aspect of the Nemesis is that for a multi-algorithm delay pedal filled with so many great sounds, it forgoes any clumsy menus in favor of tactile, hands-on control. The convenient interface and compact size make this a stellar delay pedal for cramped pedalboards or smaller travel boards. All the expected “big gun” features are here: 12 onboard delay types, MIDI functionality, presets, tap tempo, stereo I/O. I really like the optional effects loop. If you’re running a mono rig, this’ll let you add other effects to your delays. If you do need more control, you can dive into Source Audio’s Neuro App for deeper editing. You can create and store presets and access 12+ other delay algorithms which you can “burn” onto the onboard types if there’s something you’d like to replace. You’ve gotta hear that Double Helix engine – wild sounds! And if you already love the Nemesis and want more, there’s apparently a Source Audio reverb pedal coming soon! Okay, I knew this pedal was going to be good. You knew this pedal was going to be good. It’s good, really good. Better than good. The Tonal Recall is epicness in pedal form. The Chase Bliss Audio Tonal Recall is the most notable recent analog delay pedal that utilizes the reissued Xvive MN3005 bucket brigade chips, inspired by the ones used in the most sought after vintage EHX Deluxe Memory Man & Boss DM-2 pedals. Rather than just attempt to emulate (recall?) the sounds of those classic analog delay pedals, the Tonal Recall nods to these icons of tone while exceeding the usability of the older generation of analog delay pedals in nearly every conceivable way. The Tonal Recall sports a smaller footprint than your typical tap tempo analog delay pedal with a built in tap foot-switch. It gives you a host of tap divisions, short & long delay times, and an interesting “both” mode that utilizes both BBD chips for a weird “BBD Reverb” style ambience. You can also save & recall presets and utilize MIDI for parameter control and external control of most functions. Chase Bliss Audio’s unique “Ramping” is on great display here as you can modulate various parameters for interesting delay movement. The biggest draws for me are probably the Tone control and the low noise floor of the pedal. The Tonal Recall offers a wider range of tones than any vintage unit, from reasonably bright to very dark, and is quieter than those once great designs. 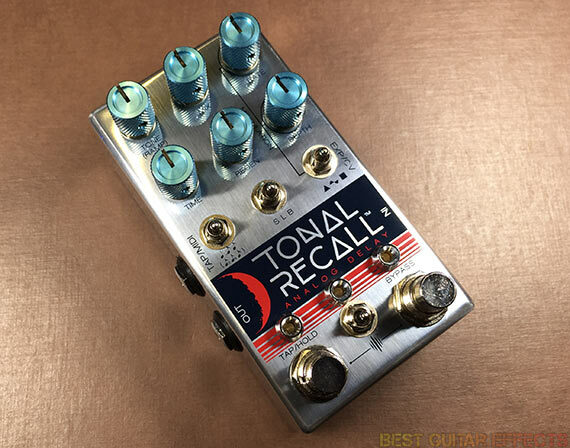 “Purists” may still argue in favor of the dusty old pedal they paid more for on the secondhand market, but there’s no denying that the Tonal Recall is a landmark release of the modern guitar pedal era and one of the best delay pedals available today. When I first heard the Empress Effects Reverb back at Winter NAMM 2016, I knew it was going to be something special. The big draw of this multi-algorithm reverb powerhouse is that its 12 selectable reverb types contain way more reverb algorithms you’d guess at a passing glance. 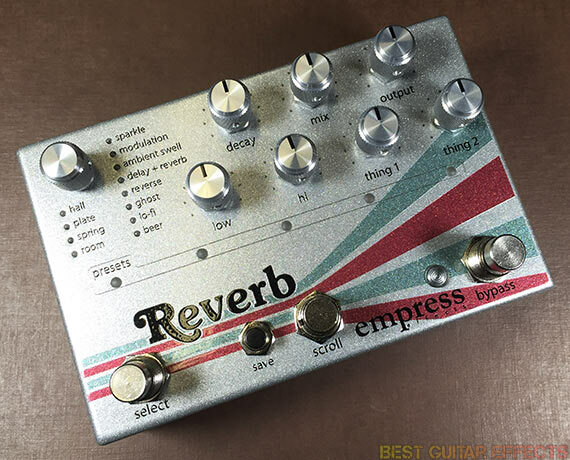 There are currently over two dozen reverb modes available with more being voting on in the Empress Reverb New Features Voting Forum. Essentially, this lets you, the reverb loving end-user help design and create the sounds to come from the Empress Reverb in the future. In addition to reverb, forum voters and Empress have been collaborating on an upcoming Looper function that should add even more versatility to this unique pedal. Back to the features at hand, everything you’d expect from stereo I/O to presets (35 total) are here. There’s even cab filtering for running the pedal without an amp, optional expression pedal control, and even MIDI functionality when used with the Empress Midibox. As far as the sounds go, the Empress Reverb really shines with its otherworldly offerings. The Ghost mode is a very cool take on a resonant reverb. The forum voted “Destroyer” reverb is a cool pitch-shifting/bit-crusher ‘verb. This pedal has perhaps my favorite gated reverb. The Sparkle bank now has a +1/-1 octave shimmer ‘verb (“Glummer”), also forum voted. There are many creative alternatives here to just simply creating a space for your guitar to sit in. 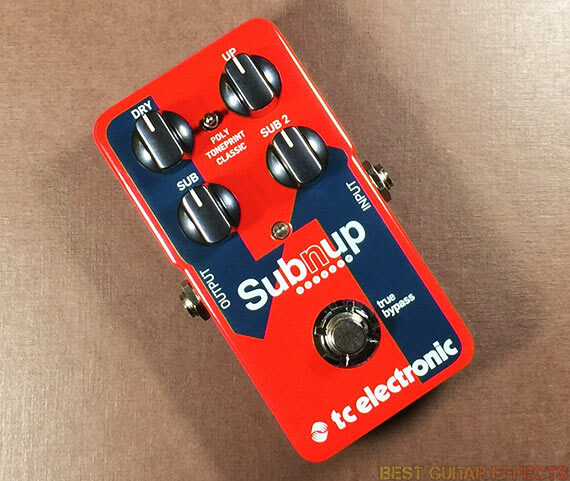 As far as simple octave pedals go, the TC Electronic Sub’N’Up is one of the best I’ve ever played. And as far as polyphonic octave pedals so, it’s also right up there with the best I’ve ever played. Tracking is impeccable. Latency is non-existent. It sounds beautiful. But that’s just scratching the surface. While the Poly & Classic modes give you a taste of the clean polyphonic tracking and grittier octaver sounds the Sub’N’Up is capable of, the TonePrint mode teases other possibilities with its mesmerizing organ-like modulated octaves. Digging in with the TonePrint Editor lets you sculpt incredibly deep sounds flavored with modulation and saturation. You can even tweak the EQ of the various voicings for deep and articulate octave sounds. If you love octaves, you must try this pedal; it goes far beyond any other compact octave pedal in terms of the amount of great sounds it’s capable of. Now if TC would just release a Sub’N’Up X2 version with more onboard TonePrints, an Up 2 voice, and exp control (& MIDI while we’re at it), you’d have a contender for the best octave pedal ever made. The Sub’N’Up surpassed my expectations in a big way thanks to a sound quality that’s far beyond its measly asking price. Let me just say that Neunaber makes arguably the best sounding shimmer reverb algorithms available in a compact stompbox enclosure. The Neunaber Expanse series was notable for their many cutting edge algorithms (The “Wet” reverb is another winner). The Expanse pedals could be configured to any other single algorithm with Neunaber’s Expanse software. 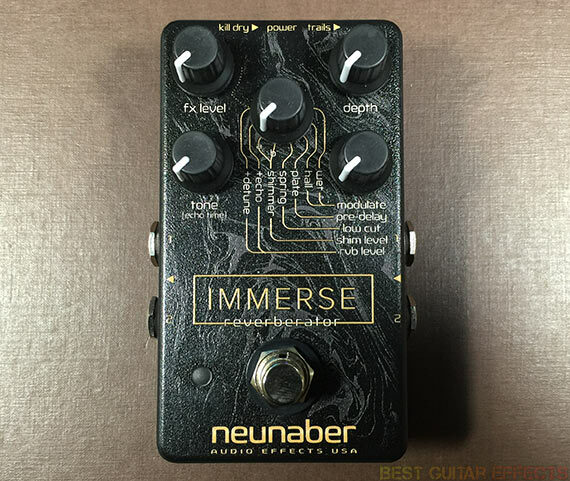 The Neunaber Immerse foregoes this software connectivity in favor of providing an onboard Effect Select knob that gives you quick access to 8 different reverb settings. The sounds include Wet, Hall, Plate, Spring, Shimmer A & B, +Echo, and + Detune. The sounds are all impeccable with a breathtaking sonic detail that exudes quality much greater than its compact size. Yes, you can run this pedal in a mono guitar rig and get stunning reverb sounds, but the Immerse sounds majestic in stereo and must be heard. The I/O jacks are fully independent, letting you feed the pedal a mono signal, a stereo input on input jacks 1 & 2, or a stereo TRS signal via input 2. Likewise, you can sum the output to mono via output 1, or output stereo via both outputs or a stereo TRS cable on output 2. Additional useful features include a Trails switch for reverb spillover and a Kill Dry Switch for outputting only a wet reverb signal. While Neunaber pedals typically had a 3-knob layout for dead simple ease of use, I greatly appreciate the extra parameter knob found in the Immerse. Dedicated Tone and setting-specific controls are a nice touch. Some guitarists will lament the loss of presets via the ExP Controller which isn’t compatible with the Immerse. While I also mourn the exclusion of presets, the ease of use the Immerse offers particularly if you just need one great reverb sound is hard to contend with in a pedal this size. And yes, MIDI compatible version with recallable presets would be amazing. EarthQuaker Devices has a long history of releasing pedals that span the bounds of pretty much any notable effect type you could think of. Sometimes they merge different effects to create new hybrid effects. The Dispatch Master is a classic example of this approach, combining delay & reverb in a single, simple to use pedal. 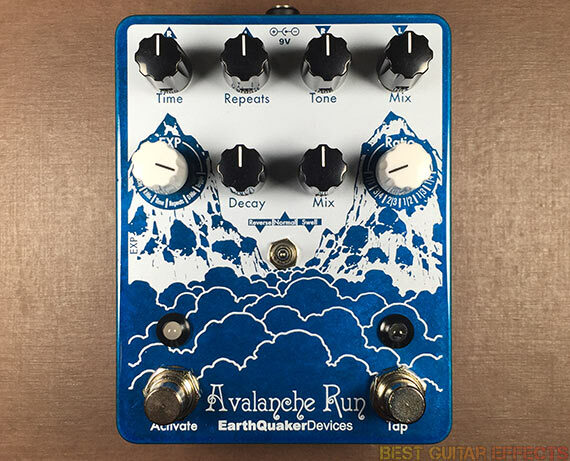 The EarthQuaker Devices Avalanche Run is the builder’s boldest release yet, born from a new high-powered DSP platform that’s a harbinger of the sonic adventures EQD will take us on in the future. The Delay section has 3 modes: Normal, Reverse, & Swell. Normal is your standard delay. Reverse does it backwards. Swell lets your picking dynamics influence the amplitude of your audio signal as you play for a lush, atmospheric ambience. There’s a slew of Tap Tempo Ratio options and a dedicated onboard Tap foot-switch. An EXP knob lets you assign parameters for expression pedal control. Try using Reverse mode with exp pedal control of Normal/Reverse. This lets you retain the Tap oscillation when pressing & holding the Tap foot-swich. It sounds truly epic. The Avalanched Run is one of the “shoegaziest” pedals around and arguably the best EarthQuaker Devices pedal released to date. 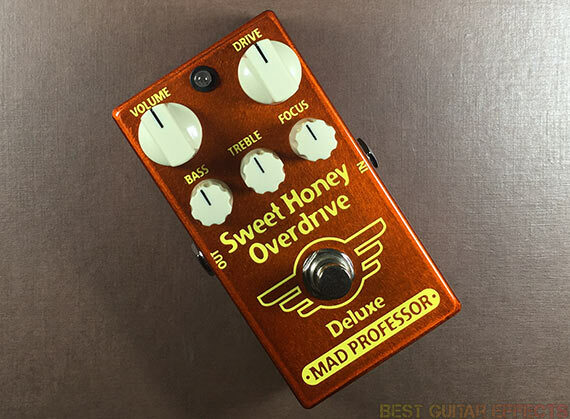 The Mad Professor Sweet Honey Overdrive Deluxe was the most unexpected surprise of 2016 for me. “But isn’t it just an overdrive pedal? Well, yes, and that’s kind of the point. I don’t often get excited about overdrive pedals. Frankly, there are just too many overdrives out there, and relatively few offer something that stands out among the heap. But among relatively simple medium gain drives, this one impressed me. The SHOD DLX forgoes a generic tone knob in favor of dedicated Bass & Treble controls. They’ve been cleverly implemented by Mad Professor with the Bass being pre-distortion to shape your tone going into the clipping section; the Treble comes after the dirt to shape your high-end and round off any harshness, useful with higher gain settings and/or brighter single coil pickups. While many overdrives promise to add an extra channel to your amp, this is one of the best pedals I’ve played for exactly that purpose. It excels at taking a clean amp into crunch territory or a crunch channel into a ripping lead. Insert your own reference to the tones being sweet as honey. The Focus knob is perhaps the star here as it changes the character and response of the pedal significantly. Lower Focus settings are warmer and less distorted. Pushing the knob to higher settings invokes a hotter sound with a slightly more aggressive treble bite. These sounds are relative and highly interactive with your guitar and amp. This makes the Focus knob more essential as you can tweak it for an excellent response with humbuckers or single coils. While the Sweet Honey Overdrive Deluxe does fall into that category of medium gain overdrive pedals, it’s noticeably more versatile than most one-trick-pony drive pedals. With the Drive turned down and the other knobs dialed in just right, you’ll notice that it’s surprisingly transparent (as worn out as that word is when trying to describe tonally neutral drive pedals). If you’re the kind of guitarist that uses 3 (or more) overdrive pedals to cover all bases, well, add this to your list of must-try pedals. The Sweet Honey Overdrive Deluxe is definitely worth checking out and just might make you replace one of your lesser overdrive pedals. Keeley Electronics had a big hit with their Monterey Fuzz/Vibe/Wah Workstation. The Jimi Hendrix inspired tribute pedal apparently inspired another famed guitarist tribute that nods to David Gilmour of Pink Floyd. Deriving its name from the iconic Floyd record, Dark Side of the Moon, the Keeley Electronics Dark Side combines a muff inspired fuzz with some of the other classic effects Mr. Gilmour notably used in his career. The Fuzz side has a killer Muff section. In addition to the expected 3-knob controls, a 3-position flip-switch provides options for Scoop, Full, & Flat for defining your response. The Mod side gives you an excellent multi-head delay with the 12 head patterns of a certain legendary echo machine. If that isn’t enough to sell most guitarists (and it’s all I thought I’d need), there’s also 4 modulation effects (phase, u-vibe, flange, rotary), any of which can be selected instead of delay. You’ll noticed that the flip-switch groups Phase & U-Vibe on the right and Flange & Rotary on the left. The Blend knob is used to select which of the 2 effects you’re using, but you can adjust the blend to create a hybrid sound between the 2 effects. For example, you can create a unique phaser/vibe sound which sounds very cool considering those 2 effects have similar origins. If the Dark Side wasn’t enough, Keeley snuck out another guitarist inspired workstation pedal, the Loomer, inspired by Kevin Shields’ guitar work with My Bloody Valentine. The Loomer takes that same great fuzz from the Dark Side and pairs it with 3 reverb modes to get characteristically “shoegaze” sounds. It’s hard to pick a favorite of the two as they’ll both appeal to fuzz lovers and fans of the guitar heroes they were inspired by. 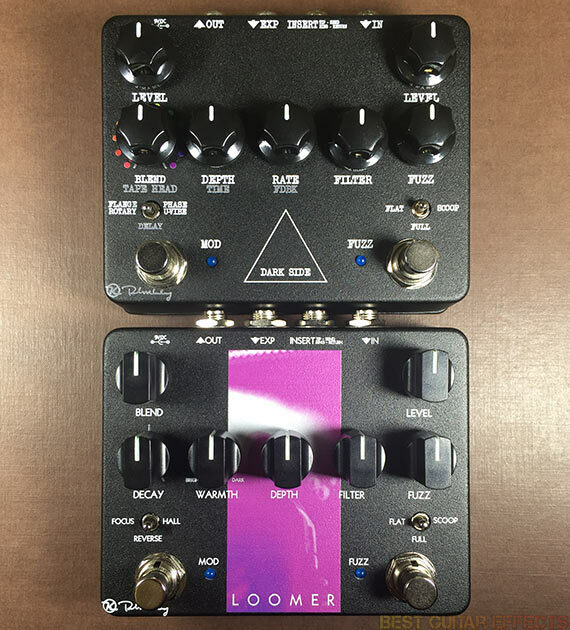 Dark Side V2 & Loomer V2: It’s important to note that these pedals originally launched with a TRS I/O jack that was later replaced with an order switch. The TRS option allowed you to patch the fuzz before an amp while routing the Mod effect to the effects loop or elsewhere in your signal chain. The V2s’ Order switch allows “on-the-fly” position reversal between the Fuzz and the various Mod effects. This is particularly beneficial with the Loomer as it allows you to experiment with “reverb before fuzz” sounds without having to re-cable your guitar rig. This is certainly a fun and welcome change that casual pedal enthusiasts will appreciate. This is one is short and easy. 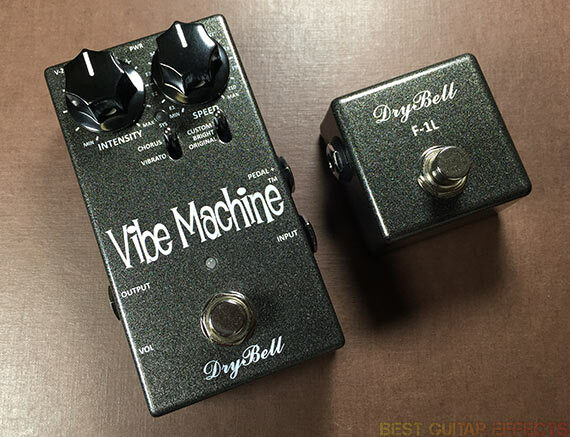 DryBell took what was arguably the world’s best compact vibe pedal (the Vibe Machine V-1) and made it better. The Vibe Machine V-2 has a few subtle but essential improvements. The new Custom setting on the impedance switch adds a 3rd option to accompany the Bright & Original settings carried over from the V-1. The Original is dark like the old Shin-Ei Uni Vibe. The Bright setting gives you a more modern sound. The Custom setting is user adjustable to any setting within the range of the other two settings. Use this mode for a setting that’s perfectly suited to your “A” guitar. You can use the other 2 settings when they’re a better fit for your “other” guitar(s). Perhaps the best surprise is that the V-2 offers tap tempo. You might have a standard single stomp foot-switch hanging around. If not, pick up a DryBell F-1L; it has a snazzy matching paint job, too. Plug it in to unlock tap tempo (or slow/fast ramping!). DryBell provides more info about this and the host of other features on their website. Still hoping to see DryBell’s take on another effect type. In the meantime the Croatian builder’s pursuit of the ultimate compact vibe pedal has yielded an improvement that elevates the Vibe Machine to greater heights. Okay, okay, I’ve gotta sneak in one more. The Dwarfcraft Happiness is just too cool. 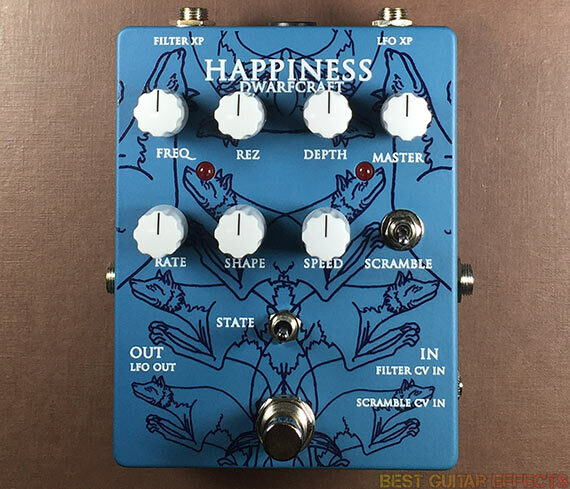 In the mold of the crafty builder’s Twin Stags dual tremolo pedal, the Happiness is a filter pedal that has high pass, low pass, and band pass modes. While you generally use the effect with the pedal’s own internal LFO (modified with the Depth & Shape knobs, LFO speed controlled by Rate), I really like being able to manually control the FREQ parameter with an expression pedal. You can take a low pass filter from fully open in the toe down position through a darkening of your sound to silence at the heel position. My one gripe is that the Filter CV In doesn’t seem to share the same full sweep range achieved from the Filter XP Input. Still, a big draw of the Happiness is the CV I/O routing as you can connect the Happiness to your modular synth rig or other CV pedals like the Twin Stags or WMD Protostar. Input a synced LFO from another source or route the Happiness’ LFO to another destination. Two other cool things worth mentioning. Crank the Rez (with the Master set very low! ), and you can create crazy drones and squeals from the pedal itself to fuel your noise rock freak outs. And flip the Scramble switch and use the Speed knob to control the speed of a “sample and hold” style filter shifting. Dwarfcraft has a cool thing going with their CV lineup, and I hope we see more. Hope you enjoyed our Top 15 Pedals of the Year 2016 roundup. Just might have to do this again if Winter NAMM 2017 is any indication of how good a year 2017 is going to be for guitar pedals. Check out the Top 17 Best Pedals of Winter NAMM 2017! Excuse me, sir, but how might I go about fueling my noise rock freakouts? oh me oh my that’s a fine selection of warbles splutters and space tones.